Successfully Added HK Warehouse Blackview E7 Smartphone - Android 6.0, 5.5 Inch HD Display, Dual-IMEI, 4G, Fingerprint, Quad-Core CPU (White) to your Shopping Cart. Meet the Blackview E7, an Android smartphone that comes with a great look and features all the hardware you need to get through the day smoothly while enjoying your phone’s latest features. Running on an Android 6.0 operating system this Chinese smartphone delivers a lag free user experience, allowing you to smoothly and efficiently enjoy all your phone has to offer. 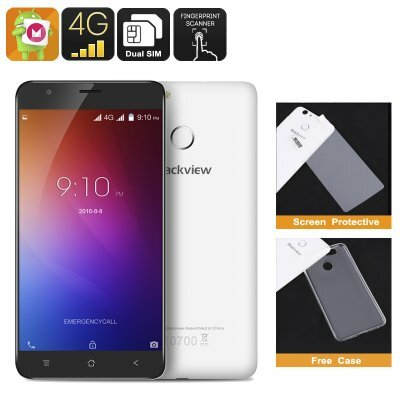 With its 5.5 inch display this Blackview phone portraits all media in stunning 720p HD quality. With its vivid colors and detailed images this display truly brings your media to life. Holding two SIM slots and featuring Dual-IMEI numbers this Android phone allows you to be connected to two providers simultaneously, giving you a good balance between work and private life. Dual-IMEI numbers furthermore allow you to connect to two different 4G networks at the same time, immensely increasing your data coverage. From now on no matter where you’re located, you can always be assured that your smartphone keeps you connected with your friends and family back home. The Blackview E7 features the MTK6737 Quad-Core CPU that has been clocked at 1.3GHz. Along with 1GB of RAM and a Mali-T720 GPU this Android device lets you enjoy the latest media and most graphic demanding games without dropping a frame. With 16GB of internal memory and by supporting a 64GB TF card this Chinese smartphone is guaranteed to offer enough space for you to save all your movies, pictures, and games alike – ensuring that you won’t run out of entertainment any time soon. So head out to the play store and download the latest apps, Games, Movies, and more for free, as with the Blackview E7 and its stunning 5.5 inch HD display hours worth of fun and mobile entertainment lay ahead. With a monstrous 2700mAh battery this cell phone provides up to 10 hours of continuous usage time – enough to get you through the most demanding of days. No long will there be the need to worry about your phone’s battery life as with the Blackview E7 you won’t run out of juice any time soon. A fingerprint sensor at the back of the phone allows you to secure your smartphone and unlock it in a split second. No longer will you have to worry about remembering PIN codes or screen patterns as now your Smartphone can be easily unlocked by a touch of your finger. The Blackview E7 comes with a 12 months warranty, brought to you by the leader in Android phones as well as wholesale electronic gadgets..